Incredible Tiny Homes represents a dream to provide affordable and comfortable housing for everyone. Randy Jones founded Incredible Tiny Homes in Morristown, Tennessee in 2014 with a passion to pursue a professional standard of craftsmanship in the Tiny Home industry. Incredible Tiny Homes builds your home indoors at our not-so-tiny warehouse. We ensure the highest quality of craftsmanship, from beginning to end, as you work with us to customize and build your Incredible Tiny Home. 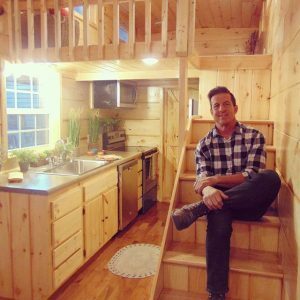 Randy Jones started his Incredible Tiny Home business using borrowed tools and has since built a business on helping people find a sense of pride in home ownership and minimalism. Randy has built over 100 homes and does so at a fraction of his competitor’s pricing. Visit http://www.incredibletinyhomes.com/ for more information. This entry was posted in Award, celebrity, honoree, Recognition and tagged founder, Incredible Tiny Homes, Randy Jones, Today's Honoree. Bookmark the permalink.